How Much Success are you Comfortable With? Remember that saying, “Failing to plan is planning to fail.”? Well in my experience this is true. One of the absolute best things I do is plan my week. When I used to leave it to circumstance it was complete CHAOS. I would fly out of bed on Monday morning running around like crazy, get to work all frazzled, run around some more, get off work and go round up the kids, get home and run around some more, then somehow my body would make it to bed and silently wonder where the day went before I would pass out. My life is different now. I feel happy, peaceful, and content. I want to share with you my the simple 5 steps that changed my days. Reflect – Pick the last day to your week. For me this is Sunday. Take 10-15 min to reflect on the past 7 days. What went well and what did not? Set Intentions – Set intentions for your week. I recommend 1-3. Intentions provide a framework for how you would like your week to go. Schedule Self-Care- Take the time to think about what you will eat, when you will exercise, and how much you will rest. If you do not plan for self-care it is likely you won’t do a good job. Make time for your priorities- Make sure to schedule activities in your calendar that matter to you. If your family is your priority make sure you schedule time in your calendar for your family. If your spiritual life is important to schedule time in your calendar. Trust me if you do not do this it makes it easy for all of your time to go to other things. Check IN– This one is golden. Do not wait until the end of the week to check in on your progress. Take a minute or two each day to check in and see how you are doing with your intentions and schedule. This all may sound super simple but do not dismiss these steps. If you do not believe me try it out for yourself. Your best life ever relies on you being intentional with your time and your week. Be intentional. 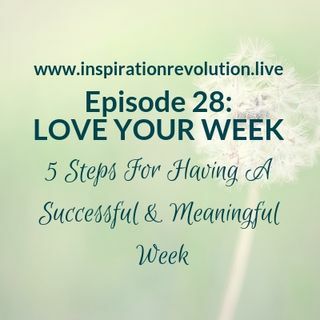 I encourage you to listen to episode 28 where I go into detail about planning your week. Click below to listen. In my experience, mental health is not something most of us talk about. There is a stigma related to mental illness. Not only is there a stigma with mental illness but any talk of mental health treatment even for prevention is avoided and often difficult to access. This saddens me considering that 99 % of illness can be traced to stress. Stress management is an essential part of mental health. It is imperative we dedicate time daily to our mental health. Mental health is the foundation for whole body wellness. Think about it. Most every illness starts because of unmanaged stress. For example; overeating, high blood pressure, elevated blood sugar and decreased immunity. SO what to do? If you incorporate the following 5 actions to your daily life your mental health will flourish and this will contribute to your whole body’s wellness. COMMUNITY! It is essential that you have community. Daily interaction with friends or family or both is essential. It is imperative to have people to share your life with. Especially people that you can relate to helps reduce stress. Find people that share similar situations; people that share your career, couples if you are part of a couple, people with children if you have children, etc. Stress dissipates when you have someone to relate to. DAILY MOVEMENT! Daily exercise is like taking an antianxiety antidepressant pill. Movement increases endorphins, boosts immune system, improves sleep, and improves overall mental well being. MOVE now it is that important!! DEBRIEFING after stressful encounters. It is essential to deal with stressful situations by speaking to a counselor or loved one. When we encounter stressful situations like; fights, abuse, car accidents, illness, moves, or any major life changes it is imperative to speak and release the event. If we do not face and release stressful situations then they stay in our tissues and it can lead to the creation of illness. DAILY MENTAL SELF CARE. It is important to prioritize daily actions that inspire our mental health. What nourishes you mentally? Whatever it is include it daily. Whether it is nature, music, people, or reading do the things that nourish you mentally, daily. MENTAL TIMEOUTS DAILY. It is imperative to be still and spend time daily doing nothing. Even if it is just for minute daily it is super important to be still free from; noise, conversation, electronics, and work. Our mind needs mental rest the way our body needs air and water. In our world where we are overstimulated, it is challenging to be still but it is essential for your wellbeing. I pray for your wellness and I pray for you to prioritize your mental health! May you evolve continuously into your absolute best self! BE HAPPY! The other day my son brought home his quarter grades most were great except for one. There was one grade that had dropped five points and although it was not alarming he identified ways he could improve so the grade would go up instead of down. Why report cards are helpful? There are two good things about grades. When we get report cards in our house I have our boys look at them. For all the grades that are good, I ask them to identify 3 key habits that are contributing to their good grades. For their grades that have dropped I ask them to identify 1-3 habits that contributed to the drop and I ask them what 1 thing, they can do to improve. Why do adults need adult report cards? As we get older many of us stop getting feedback on our progress. The closest thing is if we have a job we may get a yearly evaluation or if we own a business our bank statement tells us if we did well or not. We need to create our own adult report cards. If we do not track our progress how do we know if we are declining or improving? How do we know if what we do is working or if we are moving towards our goals or away from them? I do not know many adults who are tracking their progress. Why is tracking progress helpful? When you track your progress, it helps you to know if you are doing well and then you know to keep doing what you are doing and more of it. If things are not going well then you know you need to correct course and change up your habits to get the results you are seeking. If you do not track your progress, then it may be years before you notice if things are not going well. Tracking can also be a super positive experience. When you track your progress it can be very encouraging when you see positive results and it will motivate you to keep going. 1-What goal am I working towards? 2- How can I track my progress? 3- How often will I assess my results? 4- How will I keep improving so I can reach my goals? 5- What will I do to celebrate when I complete my goal? Do not forget to celebrate your successes. I am rooting for you! Your success matters! You Matter! For as long as I can remember I have had the same nightmare. I am being chased, it is dark, I am scared, and no matter how fast I run I know the person chasing me is getting close. In my dream, the thing chasing me will kill me if they catch me. I’m never caught but the nightmare continues! An amazing thing happened a few weeks ago. Im having the same dream. I’m so scared but all of a sudden I am sick of being scared. I am DONE!! I decide in my dream that worse than being killed is this continued running. I decide to stop running and turn around and FACE whatever is chasing me. GUESS WHAT??? When I turn around I stare at the scary monster chasing me. It looks huge and scary but the longer I look it gets smaller and smaller and then it just disappears. It is mind-boggling to me that for so many years I was so scared and the one time I decide to face my fears, it just disappeared. When I woke up I was so relieved. I am so grateful I remembered this dream because it inspired me to consider that maybe this would work in real life. Can this work in REAL LIFE? I don’t know about you but when I am angry, scared, or sad I run away from it. I ignore what is happening because I don’t want to face my dark emotions. So the past several weeks I have been facing my dark emotions and I am learning it is not that bad and in fact, there is a lot to learn from my negative emotions. Last week I recorded a meditation that helps you to face your dark emotions, energize you, empower you, and help you to strengthen your mind body and spirit. It can be extremely liberating to face your dark emotions. They are not the enemy, actually, they can help you to become a better version of yourself. Posted on February 17, 2019 February 17, 2019 Author Inspiration RevolutionCategories UncategorizedLeave a comment on How Much Success are you Comfortable With? I know when you are in the thick of things, where you are trying to advance yourself and it gets super hard that it seems like it will never get better and you just want to quit, but don’t! What you do in these moments will either propel you to the next level or set you behind. Just keep moving. Just plug away. I know it is hard but remember you have overcome so many things that at the moment felt impossible. Keep a mentality of, “I can do this!”, when you are facing a new challenge. Remember you can do it. Just keep moving forward. Put your head down and just muscle through. Before you know it you will be on the other side where it all makes sense and you can’t even relate to how it feels not to understand or know how to do what you just accomplished. Our body especially our gut is filled with good and bad bacteria. Good bacteria keeps the bad bacteria in check. Maintaining healthy gut bacteria affects many aspects of wellness. Research is now showing that probiotics contribute to many parts of our wellness. Probiotics can help prevent constipation and help to stop diarrhea. Probiotics can help our immune system, boost metabolism, help with weight loss, and improve overall wellbeing. Probiotics can help more complex diseases that affect the gastrointestinal health like Crohn’s disease and Irritable Bowel Syndrome. A 2005 study by Harvard Medicine shows that probiotics help to alleviate allergy symptoms including; seasonal allergies, asthma, and eczema. In 2006 a study by Stanford University showed that individuals of healthy weight have a good amount of healthy bacteria compared to overweight individuals who have less good bacteria and more bad bacteria. It is super easy to include probiotics and there is nothing to lose and everything to gain by including some of these items in your diet. I invite you to try adding a probiotic-rich food daily and see how you feel. Let me know if you do. I am rooting for you and wishing you the best. Well, I have good news and bad news for you. First the bad news, IT’S NEVER A GOOD TIME. The good news, since it is never a good time to change then it is always a good time to change ehhhhh righhht?? This last year I have started to call BS on myself when I have a desire to do something new and I think….. but it’s not a good time….. BS! It’s never a good time. So the right time is now. We are beautiful divine beings who are intelligent beyond reason. If you are having a desire to try something new, there is a reason this is happening. IT is not a mistake! Listen to your inner wisdom. Instead of thinking it is not a good time I challenge you to think, “how can I make it happen?” You are a crazy intelligent human being and even if you work, have 10 children, drive a minivan everywhere, volunteer, go to school, etc. There is always a way. Set your intentions, pray, and trust that when you ask how can I make it happen the answer will come. We spend more time thinking and rationalizing about how this can not work instead of brainstorming solutions or even better yet just doing it. If you want to exercise more and spend a minute 30 times a day thinking about how it is not possible you can save time and drama by just exercising without thinking about how you can’t. Get it on Popeye Style! I have written about greens many times before but they are so important that I will write about them again. Today my goal is to inspire you to eat more greens and to give you more tangible ways of including them in your daily diet. Greens are amazing they have Vitamin A, B, C, D, E, Minerals, Antioxidants, Fiber, Calcium, Iron, Enzymes, and many others! Not many other foods can make these kinds of claims. There are so many great ways to add greens to your daily menu. Starting with breakfast. I encourage you to try lightly steamed greens with garlic, sea salt, and olive oil with your favorite breakfast foods. Green smoothies are my personal favorite way of consuming 3 cups of greens to start my day! Please see my green smoothies recipes on the home page. Green smoothies can also be consumed for snacks. For lunch try steamed greens with legumes. For any meal eat SALAD!! I like to have a lovely salad filled with greens for both lunch and dinner. Instead of using bread or tortillas consider using a sturdy green like collard greens or kale to wrap your veggies, legumes, tofu, or animal protein. Greens have a bitter taste to them but the more you eat the more you will find your body craves them. Our body needs all tastes to operate optimally including bitter tastes. Greens become more palatable the more you eat them. One thing I love about greens is that they are so nutrient dense that when you consume them you will eat less because your body will be nourished. Many times our body craves food because it is unsatiated with processed foods that lack nutrients. The more greens you eat the more energy, life, and vitality you will feel. If you do not believe me just try it for a week. Make it a goal to include greens in each of your meals and your snacks. I wish you nothing but the best in your green eating venture!! I am all for goal setting and planning, I LOVE IT! I also love planners, reading about doing, and thinking about doing….. BUT at some point, there must be doing. DOING the definitive moment where we go from dreaming and planning to ACTUALIZING. While dreaming and planning can be fun and romantic at some point if we do not move past this there is the chance we will become disillusioned or stagnant. So the answer is doing. My question for you, What have you been thinking about doing? If you feel apprehensive or scared or start to negotiate mentally with “But, but, but.” This is a sure sign that it is time for doing. I wish I had a graceful process to share with you to inspire you to get doing but in my experience, we just have to do! That’s it. JUST DO IT! There is a reason Nike coined this phrase, there comes a time when we are past thinking, planning, and dreaming it is time to DO! So what will you DO next? If you want to share I would love to hear from you. Please let me know if this is helpful. I am rooting for you. One of the human traits that fascinates me the most is our habit of thinking we know what others are thinking and playing out whole scenarios in our head without ever discussing with the other person to find out if what you are thinking is true. I am guilty of this. Periodically I think someone is mad at me or upset and I create elaborate scenarios in my head and worry about and sometimes even get angry, all without ever talking to the person and asking if what I am assuming is correct. I am always humbled to discover that I am mostly wrong. When I ask the person to confirm or deny if what I am thinking is true 9/10 times I am wrong. STOP! Take a deep breath. Share your thoughts with the person and as them to communicate their truth with you.